Bouira (Algeria) — Minister of Energy Mustapha Guitouni on Sunday in Bouira called on all Naftal officials to generalize the Liquefied Petroleum Gas (LPG) conversion centers across the country to encourage the use of this energy with a view to cut fuel import. 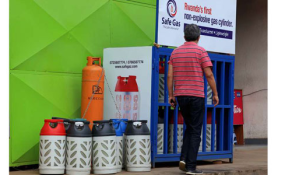 "People have to drive LPG cars, and we need to generalize the conversion centers across the country," insisted the minister who inaugurated in Bouira a number of the energy sector facilities. Guitouni advocated for a wider use of this energy through the creation of conversion centers, calling on Naftal managers to train young engineers and technicians to enable them to set up their LPG conversion companies. "Currently, 400,000 vehicles have been converted into LPG, and we have reduced the fuel import bill. Thus we have launched a programme for the conversion of one million vehicles by 2021," the minister told the press, while commissioning a station of public gas distribution for 840 households in Ahnif (east of Bouira). Regarding the Highlands Energy Plan, the minister stressed the need for Algeria to move towards this "clean and less dangerous" fuel. "Algeria currently possesses 22,000 MW solar energy capacity of which 400 megawatts are already exploited, thanks to the President programme," said Gutouni, adding that the "maintenance of the equipment is ensured by Algerian engineers." "150 megawatts will be destined to local investors in partnership with foreign investors," said the minister.